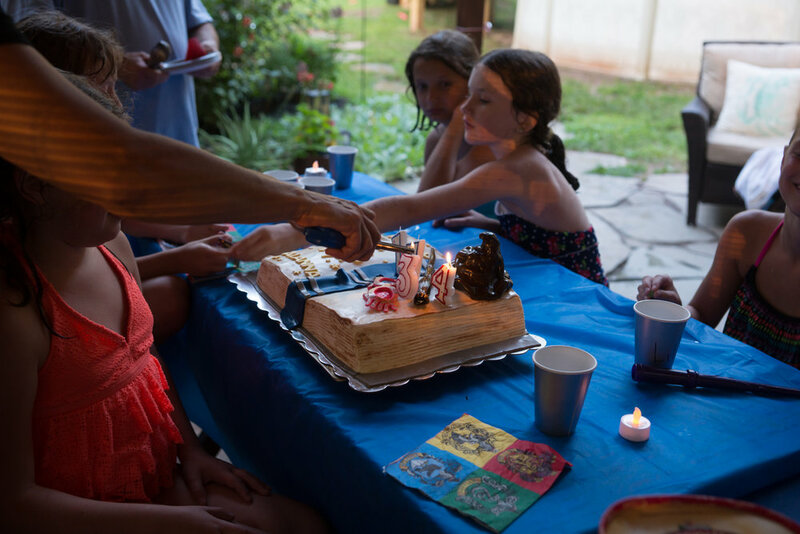 A little more than 2 weeks ago, we had a birthday party for our Alanna. But it wasn't just another birthday party. Oh no, that simply would not do. Her actual birthday is in the middle of December, in the midst of all the holiday hoopla, when schedules of activities, festive parties and the overall hustle and bustle of the season have a way of diminishing the celebration of a birthday. Something had to be done about this! Last November, I sat down with Alanna and we brainstormed ideas for her upcoming 11th birthday. As many of you already know, she's a HUGE Harry Potter fan! Remember this story from our adventures at Universal Studios Orlando? If you didn't read about it yet, it definitely helps with the backstory here. We came up with the idea to have a summertime, pool party to celebrate her birthday, with a Harry Potter theme!! We decided to celebrate her 11 3/4 (a spin off of Harry's 9 3/4 platform to enter the train depot that takes all the wizarding students to Hogwarts!) year - which is also unique since Harry was 11 when he first learns of Hogwarts - actually on his birthday, no less! I'll try not to give too much away if you don't already know the story! The photo booth with her besties!! Emilia wasn't happy until she was right next to her sister! And a gourmet dining experience of neapolitan cheese pizza pie, french fried potatoes, and a side of assorted fruit. I know, fancy - right?! Ravenclaw's house colors proudly displayed. After bellies were full and satisfied, the girls were ready for some cool fun in the pool! It was a hot August evening - just perfect for swim time! Besides Kurt and I, one of my dearest friends, Jen, stayed to help chaperone the party. She and her daughter actually made the trek from their home in New Jersey to be with us and stay the night. Thanks again, Jen!!! I'm so grateful to you for all your help and for capturing these next ten or so frames for me since I had to make a run to get ice cream for the cake just as our honored guest, Madam Esmeralda arrived. I sure wish I had been here to witness this phenomenal psychic powerhouse of a woman from Romania read the girls auras and tell their future using mere ice in plastic cups and an I Spy "Go Fish" deck of cards!! Wow!! I heard she even knew all their names - even some of their middle names! I tried to get Professor Trelawney to come, but she had other plans. Nonetheless, Madam Esmeralda of Romania brought tons of laughs! What a fantastic show she put on for the girls! I heard she kept saying that she is "always right and never wrong!" What a gifted fortuneteller Madam Esmeralda is! She gave each partygoer quite a thrill of positive feedback and hope for bright days ahead. I also heard that after each reading she gave each girl a beautiful blessing of love, sending them off with joyful, carefree hearts! After Madam Esmeralda was finished with her show for the girls, and made her grand exit, it was time for cake!! And cake we had!! Funny story to share. I asked a friend, who happens to be an amazing cake decorator, if she would make Alanna's cake for us. Oh, please?! It turns out she was not available, and was super busy with her daughter's upcoming baby shower. Oh no! What to do? I told another friend of mine about my cake dilemma and she happily referred me to a wonderful cake decorator Kortney's Confections - who delivers! (Thanks, Kristan!) Wow, that's unique and would be a great help! I checked out some of her work online, and got in touch with her right away. We texted each other with the party details and within a few sentences, she had it all laid out and would take care to make the cake something Luna Lovegood (Alanna's favorite Harry Potter character) would be proud of!! The day of the party, Kortney arrives with the cake. Yay! There's a million, bazillion things that need to be done and my mind is racing in all sorts of different directions! She walks into our home and I look at her. "You look SO familiar to me!" Kortney says, "I used to hang out with Chelsea!" No way!! So, it turns out I remember Kortney from her high school days when she and my Chelsea were close friends, more than ten years ago!! It's a small, small world after all!!! :) It was neat to catch up - and she's still as sweet as she was in high school!! Kortney's cakes are Incredible!! Everyone raved about how creative her work is and how scrumptious it was too!! Thank you, Kortney!! You did the house of Ravenclaw proud! You're my go-to cake lady now!! I don't think I can remember the last time I saw my beautiful Alanna smile so much, so freely, so joyously during any of her past birthday parties than I did at this one. She was absolutely radiant! Earlier, when everyone arrived, Alanna had sorted her friends into either the house of Ravenclaw or Gryffindor in order for them to have a balanced match of Quidditch. The girls were able to use 2 different golden snitches for the game - first, the girls used a heli ball that Alanna's Granma sent with love just in time to use for the party!! (Thanks, Mom! The girls loved it!!). And the second golden snitch was our very own Emilia! :) The game against Gryffindor and Ravenclaw ended in a tie - I think! I'm not really sure. I think the girls just had fun riding around on their brooms and trying to figure out where the golden snitch was going to end up! Jolly good fun!! After the game and the sun went down, it was time for sparklers! Nothing says "summer parties" quite like a small inferno of fiery sparks to wave around or dance around with, whichever you prefer. The magical night ended much too soon for our 11 3/4 birthday girl. She couldn't say it enough, with more smiles and hugs - "This was the BEST day/party of my life!" And, "Thank You!" Okay, I think we had a winner!! :)) Many thanks going out to Alanna's friends for making the celebration extra grand and memorable for all who were able to make it! I think our girls will be talking about this party well into their senior years, as they look back on all the fun of this magical August night.